Local singer/songwriter breaks out some classics as well as brand new material on our li’l stage. 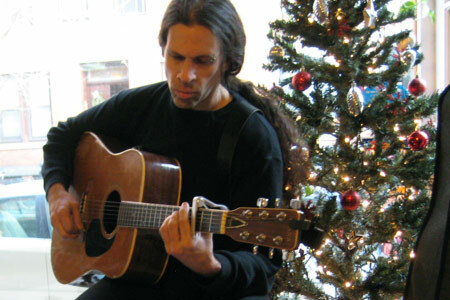 Josep Pla is an American songwriter and guitarist based in Jersey City, NJ. He is the vocalist-guitarist and co-founder of clueLess with his brother Nelson Pla and is the lead guitarist for his wife Karen Davis. His musical track record is a varied one. He has played in many local bands over the years including; Mist Procession (also with his brother Nelson), Sweet Convulsions, Erotomechanics, Ya-Ne-Zniyoo (with D’s Soul Full Cafe owner Stephen Bailey), I.D.K., Motor Betty, Aluminum Babe, Tripp7, SS99, Barbiana Complex, Poster Child, and Lick. He is currently recording new material for the followup to ‘The Best of clueLess Vol. I’ at Upstart Studios in Hoboken. He is also working with Karen Davis and Barbiana Complex drummer Mike McCann on a project called ‘Siege Engine’. For his Sundays on our li’l stage, Josep will perform older original tunes, a few choice covers as well as a selection of new material from an upcoming release titled ‘Electric Skin’. We’re inviting others who may want to play as well to bring your guitar or ukulele or Theremin or holophonor or whatever. – Check our Twitter/Facebook for a schedule of special guests.